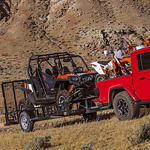 Available in four models, the 2020 Jeep Gladiator is designed for people who like to work hard and enjoy nature. This all-new pickup truck is available for sale at Elm Grove Chrysler Dodge Jeep Ram. More than 10 exterior paint colors are optional for this tough American vehicle. Granite Crystal, Sting Gray and Gobi Clear are some finishes that make the Gladiator look great in rugged settings. Gator Clear and Billet Silver also give this pickup truck some nature-inspired styling. Punk'n Metallic has a bright orange hue that surely highlights the car's muscular profile. Additionally, you can select Firecracker Red to make a big fashion statement on the highway. Every door in the 2020 Gladiator could be removed for extra utility and comfort. Several removable tops for the roof are also available for true off-road lovers. For example, you can get the Black Sunrider hard top that has three pieces that quickly open and close.